Royal Wheels India is an adventure travel group organising Cochin Tours Package. Queen of the Arabian' Sea is the commercial capital of Kerala. Cochin has one of the finest natural harbors in the world. Cochin was once the major center of commerce and trade with the British, Arabs, Chinese, Portuguese, Dutch. Kochi earned a significant position on the world trading routes after the world famous port at Kodugallur (Cranganore) was destroyed by massive flooding of the river Periyar in 1340 AD. Records show that Kodugallur/Cranganore was known to the Arabs and Chinese traders for centuries. started to grow and soon developed into a major trading point dealing in pepper, cardamom, cinnamon, cloves, etc. which were and still are famous for their quality. One of the most beautiful and famous beaches in South India, is the best place for relaxation. It has three different beaches of which the Lighthouse beach is the most famous beach. Ayurvedic treatment especially during monsoon is another attraction of Kovalam. This enchanting strip of golden sands is laced with the rich greenery of coconut palms. A former fishing village, Kovalam is just 16 kms away from Trivandrum, Kerala's capital city. 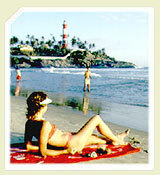 Kovalam is an evergreen and pleasant climatic beach resort. It is a dreamy place for tourists all over the world. Today Kovalam beach is known as the "Paradise of the South".